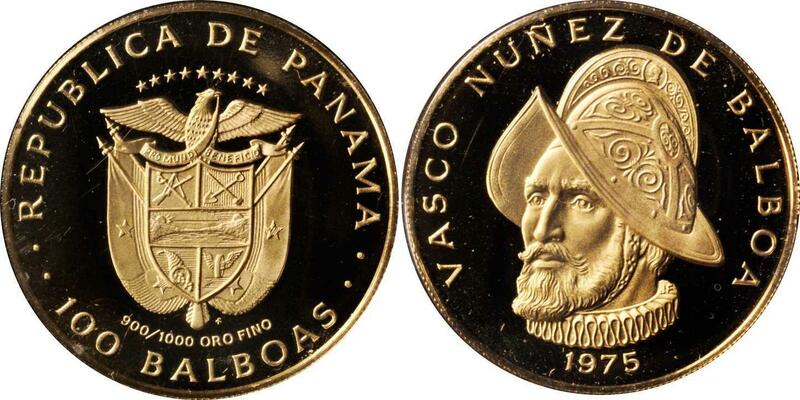 Vasco Nuez de Balboa (c. 1475 – January 15, 1519) was a Spanish explorer, governor, and&nbsp; &nbsp; &nbsp;conquistador. He is best known for having crossed the Isthmus of Panama&nbsp; &nbsp; &nbsp;to the Pacific Ocean in 1513, becoming the first European to lead an&nbsp; &nbsp; &nbsp;expedition to have seen or reached the Pacific from the New World. He&nbsp; &nbsp; &nbsp;traveled to the New World in 1500 and, after some exploration, settled&nbsp; &nbsp; &nbsp;on the island of Hispaniola. He founded the settlement of Santa Mara&nbsp; &nbsp;la&nbsp; &nbsp;Antigua del Darien in present-day Colombia in 1510, which was the&nbsp; &nbsp;first&nbsp; &nbsp;permanent European settlement on the mainland of the Americas (a&nbsp; &nbsp; &nbsp;settlement by Alonso de Ojeda the previous year at San SebastiÃ¡n de&nbsp; &nbsp; &nbsp;UrabÃ¡ had already been abandoned). 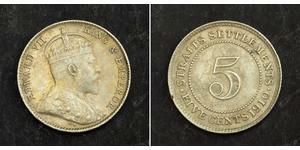 All visible dust particles are outside of the slab and not on the coin. 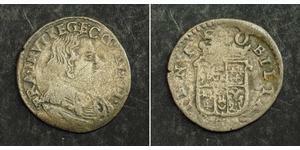 A truly spott-less and beautiful gold coin! Panama, officially the Republic of Panama, is the southernmost country of Central America. Situated on the isthmus connecting North and South America, it is bordered by Costa Rica to the northwest, Colombia to the southeast, the Caribbean Sea to the north and the Pacific Ocean to the south. The capital is Panama City. Explored and settled by the Spanish in the 16th century, Panama broke with Spain in 1821 and joined a union of Nueva Granada, Ecuador, and Venezuela – named the Republic of Gran Colombia. When the latter dissolved in 1830, Panama remained part of Colombia. With US backing, Panama seceded from Colombia in 1903. The Panama Canal was built by the US Army Corps of Engineers between 1904 and 1914. In 1977, an agreement was signed for the complete transfer of the Canal from the US to Panama by the end of the century. Revenue from Canal tolls represent today a significant portion of Panama’s GDP. Panama has the third or fourth largest economy in Central America and it is also the fastest growing economy and the largest per capita consumer in Central America. In 2010 Panama ranked 4th among Latin American countries in terms of the Human Development Index, and 54th in the world in 2010. Panama as 2010 is the second most competitive economy in Latin America as well according to the Global Competitiveness Index from the World Economic Forum (WEF). Panama has the largest rainforest in the Western Hemisphere outside the Amazon Basin and its jungle is home to an abundance of tropical plants, animals and birds – some of them to be found nowhere else in the world. 1975,PANAMA. 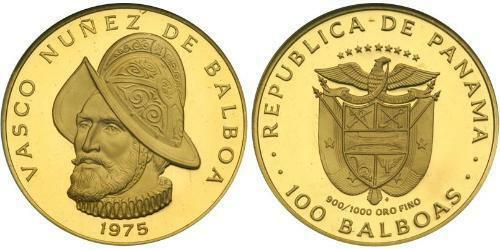 100 Balboas, 1975-78.Fr-1 & 5; KM-41 & 56. 5 pieces in lot. 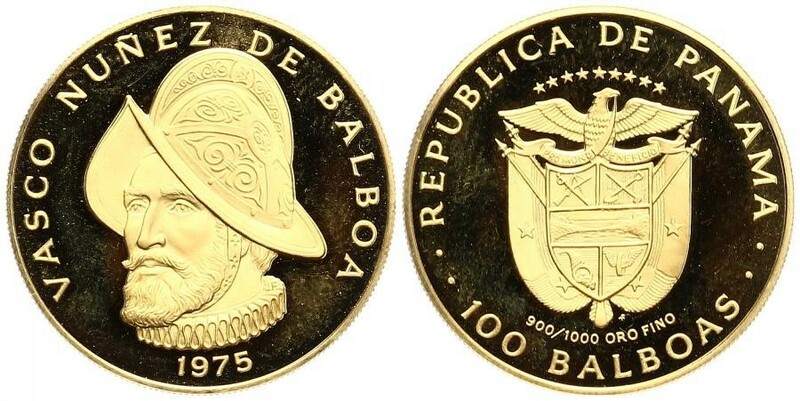 Comprised of (4) 500th anniversary of Balboa's birth with duplication of the 1975 issue and a 1978 Peace and Progress issue. All are sealed in their original mint envelopes. SOLD AS IS/NO RETURNS.